Matthew Gault from Dungiven YFC has been named the winner of the Young Farmers’ Clubs of Ulster 2019 Silage Making Competition sponsored by John Thompson and Sons Limited. The annual competition saw YFCU members from 30 clubs across the country taking party to showcase their silage making skills. The regional heats took place at the beginning of January with the highest scorer from each county making it through to the final on Wednesday, January 30. Judges Ronald Annett from John Thompson and Sons Limited and Roger McCracken from Ballywalter YFC travelled through the snow to the farm of each finalist to carry out a visual inspection of their competition silage, taking into account its fermentation, digestibility and dry matter content as well as the sealing of the silo and the way in which the effluent was collected. Mark Johnston from Randalstown YFC was placed second, with Andrew Patton from Newtownards YFC in third. Andrew Boyes from Bleary YFC, Trent Brown from Seskinore YFC and Stewart Reynolds from Lisbellaw YFC were also highly commended for making it through to the final stage. 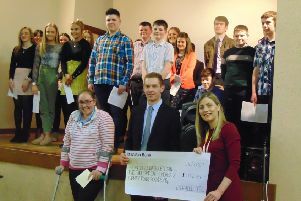 YFCU would like to thank the judges for taking the time to make their expertise available to the association.